AshleyNewell.me: It's Monday, Where's the Coffee? It's Monday, Where's the Coffee? Hi friends! I hope you are doing well! Happy Monday! (Is that an oxymoron?) We have RAIN today! California is in a horrible drought if you didn't know. Most of us have let our lawns die and have given up washing cars and other things to help conserve water. I'm so freaking excited about this rain and I hope it keeps up. I'm blogging again today. I'm pretty proud of myself. We'll see how far I make it into NaBloPoMo. 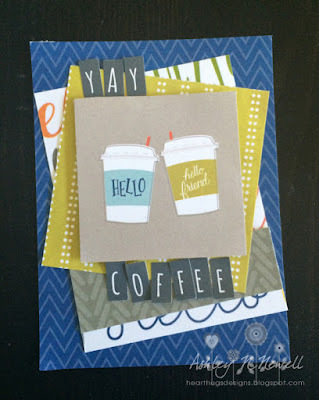 Today, I have a card I made at the same time as the pocket card I made yesterday. I used the Pebbles Happy Day collection which is still one of my very favorites. It just has tons of awesome stuff that I love like coffee, cameras, Instagram, takeout, and more. I added some alpha stickers from the Target Dollar Spot to spell out my sentiment. I hope you all have a GREAT Monday! And thank you to those who are leaving comments! It's very encouraging as a blogger. Such a fun card! What we need today! What a lovely card! Just what I need! Fun card! Love those alpha stickers and the journaling card! Stopping by from the Blog Her Blog roll. Have a great NaBloPoMo. Coffee!!!! I see you are making cards about the MOST IMPORTANT thing on the planet!!! I am positive that you will make it through the entire month. I have faith in you.